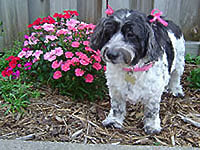 Wear a rainbow of vibrant colors around your wrist in memory of all the beautiful times you shared with your beloved animal companion. Each silicone wristband is engraved with the words “I’ll be waiting for you at the Rainbow Bridge.” Dog and cat paw prints complete the band. The wristband is approximately 8” in circumference and will fit most adult wrists. 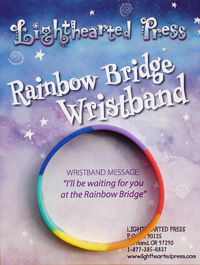 A copy of the Rainbow Bridge Poem is printed on the back of the wristband package.